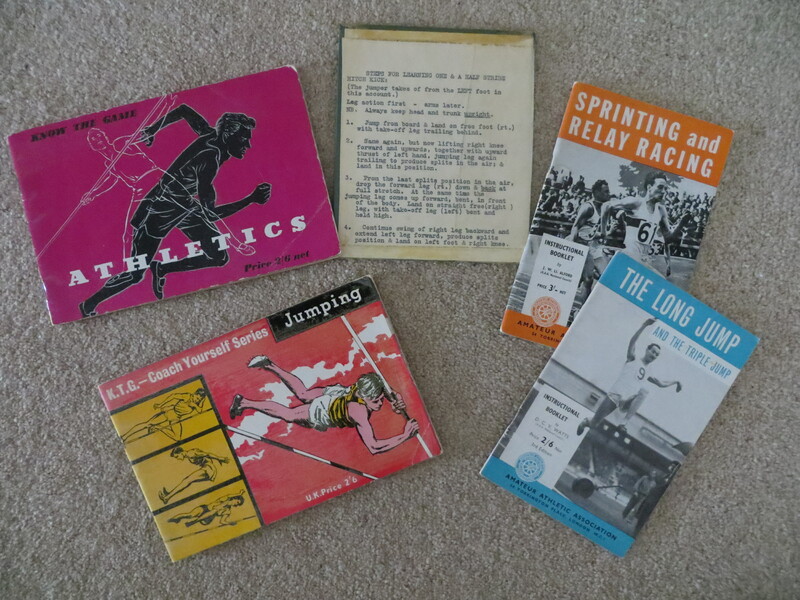 I was a keen athlete when I was at school and collected a number of ‘how to’ booklets and training aids which are now quite precious to me – see below. Unfortunately they are thin soft backs which flop around and have no space for spine titles, so they don’t sit very well on a bookshelf full of hardbacks. I needed some sort of container on which a title could be inscribed. I asked at the bookbinding class that I go to, and was told I needed to make a Portfolio – apparently a common construction in the bookbinding world. A Portfolio is made in two parts: the outside piece which folds over so that, like the outside of a book, it provides a base, a spine and a front cover; and an inside envelope with flaps, which is glued onto the base of the outside piece. The finished portfolio is shown below. 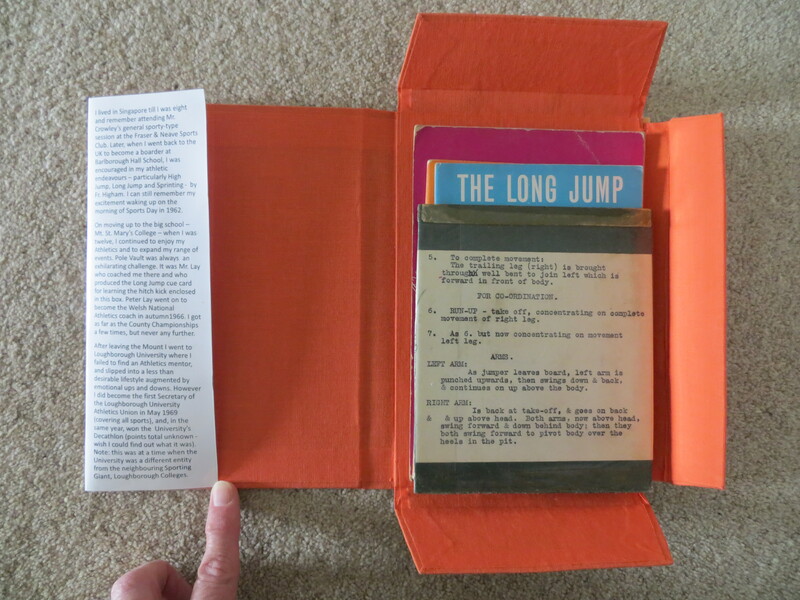 To this basic construction I decided to add a dust jacket which is attached to the portfolio by gluing the right hand flap of the dust jacket between the outside and inside pieces. 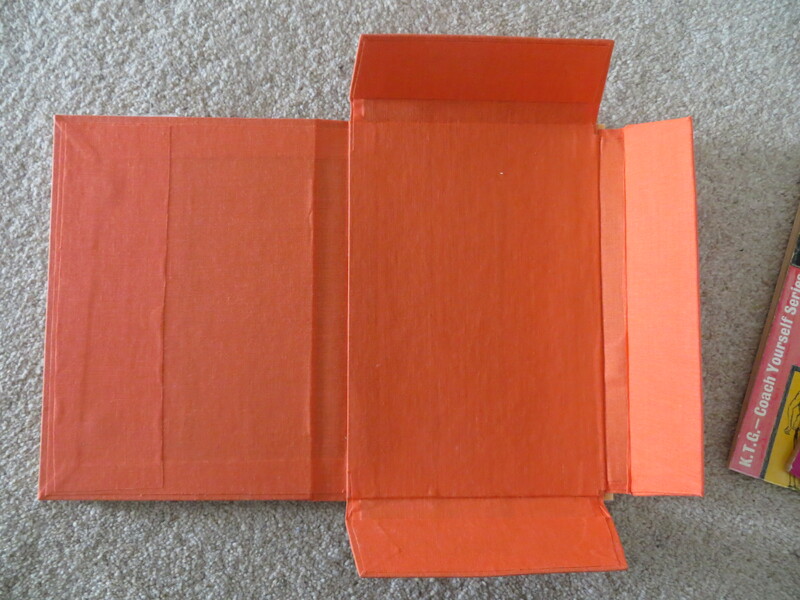 The remainder of the dust jacket wraps around the portfolio such that the left hand flap goes inside the front cover. 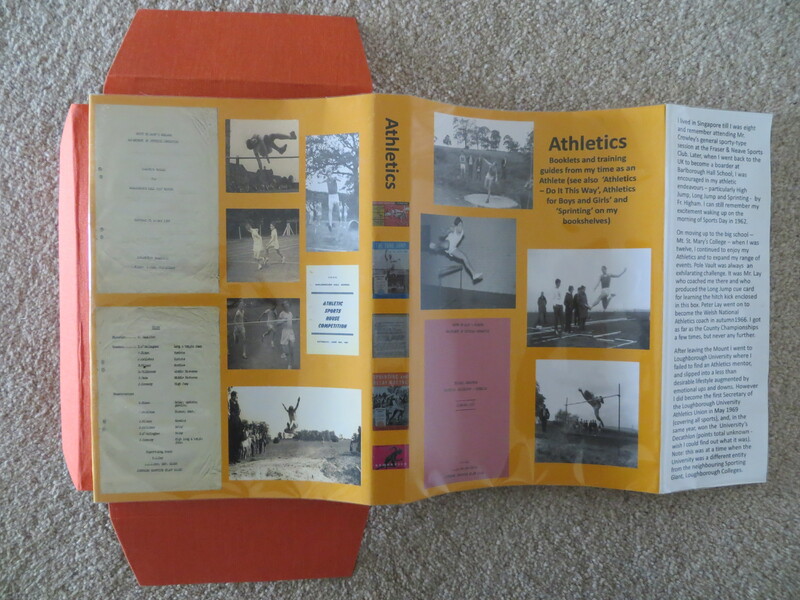 As with the rugby book, I used the dust jacket flaps to write about my athletics endeavours; and I included copies of some memento documents on the rest of the jacket. However, I tried out a couple of new things on this dust jacket: first, I included several old photos and this seems to have worked very well – photos are easy to see and speak for themselves. Secondly, I put thumbnails of the Portfolio contents on the spine instead of a written title. 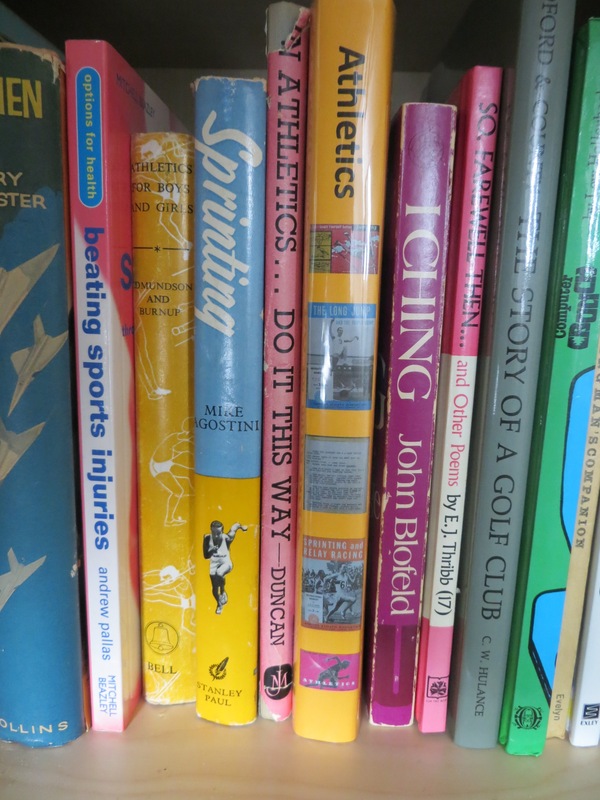 This too has worked well and produces a colourful and interesting spine on the bookshelf. In retrospect, I think I was too ambitious with the memento documents I included – the text is too small and indistinct to read easily as a result of wanting to display the whole of a memento page. Perhaps next time I put a jacket design together, I’ll explore just including selected parts of a page magnified to a level where it is very easy to read.